The number 13 from time immemorial treated with caution. Many believed that it was endowed with negative energy, and therefore brings unhappiness. Some peoples, on the contrary, attributed to him beneficial properties. In numerology, this ambiguous number occupies a special place. The Devil’s Dozen has long been associated with negativity, and the fear of the number 13, which scientists have even identified as a separate phobia, has its own reasons. The number 12 — a dozen — was considered by many civilizations to be a happy sacred number, and this is quite justified: Pythagoras, who laid the foundations of numerology, noted that a dozen symbolizes the completeness and harmony of world space. The number 12 is associated with time cycles (12 months), daytime (12 hours), the generally accepted number of zodiac constellations. The number 13 exceeds a dozen, goes beyond the scope of order and harmony, belongs to the sphere of chaos, disorder, irrational forces, therefore it acquires a sharply negative meaning and is called by analogy with the number 12 a “devil’s” dozen. 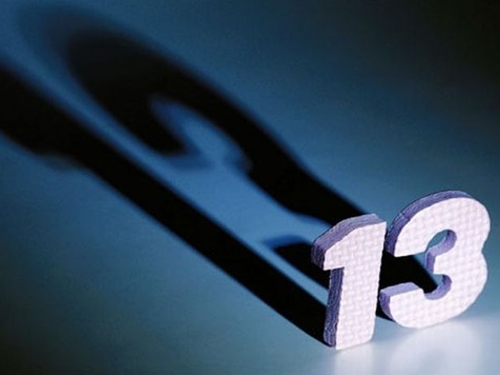 In the negative perception of the 13th there are religious motives that are also taken into account in numerology. At the Last Supper at the table was attended by 13 people: the thirteenth was Judas, who betrayed Christ. Later, there was a sign that if 13 people gathered together at the dinner table, the first person to get up from the table would go to another world within a year. There is also a legend that Lucifer was the thirteenth angel, who later rebelled against the will of the Lord, who left the Kingdom of Heaven and became the lord of evil. 13 is considered the witch number. According to the legend, 12 witches participate in the sabbath, and the devil is the 13th participant in the dark rite. The temporal calculus of witches, contrary to the harmony of the dozen, revolves around the number 13: according to the dark calendar, the number of months is 13 (28 days in each month). The negative energy of the 13th day is explained by the fact that the thirteenth Tarot card denotes death. The same meaning is acquired by the letter «M» from the ancient Israelites: the word «death» begins in their language, it also denotes the number «13». In numerology, there is an opposite view of an ambiguous number. It is associated with unexplored cosmic processes, the energy of rebellion and natural forces beyond the control of human consciousness. No matter how harmonious the number 12 is, it is impossible to fit the Universe into it. The moon, which has a tremendous impact on earthly life, goes through all phases 13 times a year, respectively, the number of lunar months is thirteen. In addition to the 12 generally recognized signs of the zodiac, there is the thirteenth — Ophiuchus, not included in the zodiac circle. There is an opinion that there are thirteen stargates in the universe, opening the entrance to other dimensions. In numerology, it is believed that the number 13 is a symbol of inexhaustible power and strength. Numerology gives people, who correspond to the number 13, positive characteristics. According to the numerological horoscope, the 13th number gives a person creative potential, developed intuition and even supernatural abilities. No negative impact of the “devil’s dozen” on the fate of a person born under its influence was detected. The prejudices regarding the negative energy number 13 still persist. In some countries, when numbering buildings, floors, apartments, this number is skipped. In hospitals it is rare to find place number 13, the same applies to ships, hotels, airplanes. On Friday, 13 are afraid to do important things, or even go outside.